In February of 2009, I walked into my very first Weight Watcher’s meeting. By July 2010, I had lost 75 pounds. I felt good in my clothes but still didn’t feel great physically (I was a meat eater then). Even still, I maintained my weight for about five months. Life became more hectic and it was difficult to make it to my meeting. Plus, it felt like some of the incentive was gone to attend meetings as a lifetime member. And then they changed the plan to the PointsPlus system right before the holidays. I really feel like that was pretty cruel, especially for those of us who had the old plan memorized and were banking on cruising through the holidays on auto pilot. My body didn’t react to the new plan very well and I gained five pounds immediately. The moment I had to pay for a meeting again, I was really upset (if you are more than 2 lbs above your goal weight, you have to pay… I was five). I kind of wish they had given lifetimers a little time to figure out how the plan worked for them before charging them when their weight suddenly spiked. Of course, I’m sure doing this right before the holiday season was financial genius because a lot of lifetime folks, like myself, ended up gaining and returning to the paying lot. So, I dropped Weight Watchers and continued to gain and lose weight with a steady upward trend. After going vegan, the weight began to slowly come back off. Unfortunately, with the series of injuries I’ve had lately, it’s returning and quickly. I’ve tried counting calories. This proved counter productive because I associate calories with dieting (read “starvation”) and it really messes with my mind. The Husband says he doesn’t see how points and calories are different, but he does admit that he hasn’t been “dieting” (read “starving”) since the age of 12 either. 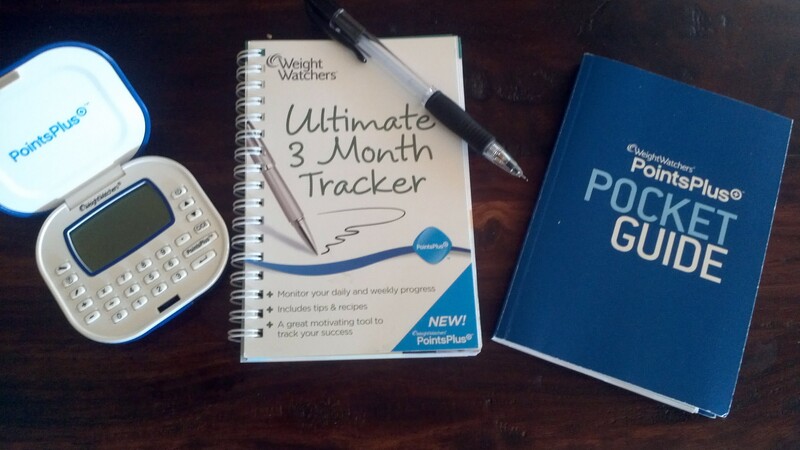 Yesterday, I decided to give Weight Watchers another chance, this time as a vegan. I went on a mass hunt throughout the house looking for my old materials. I knew I threw away some of them back when I was so mad at the company. Fortunately, I still have enough to work the plan manually. I’ll admit that during my successful stint with the old plan, I never was a “paper tracker”. I always used eTools. Well, I refuse to pay for eTools until I find out if the new plan works with vegan. You may think that sounds ludicrous because WW states that you can eat anything on their plan and still lose weight. Well, vegan is a bit different and I’ve read a few blogs where vegans have had difficulty with it the PointsPlus plan. It seems that by making all fruits and most vegetables zero points, vegans (who eat primarily those things) tend to need to adjust the points some. For example, calculating the ingredients in my green smoothie individually, costs me 3 points. However, calculating while ignoring the zero point foods rule, it comes out to 13 points. That’s a pretty big difference. The company says that it has accounted for the zero point foods already stating that “in general, we don’t see people becoming overweight because they ate too many bananas.” [WW PP Getting Started booklet p. 58] I’m curious to see what will happen. Worst case scenario, I keep gaining weight and have to come up with something else. Next we have the WW “good health guidelines”, which recommend eating oil, dairy, and lean meat. I’m going to use this opportunity to say, read The China Study and Prevent and Reverse Heart Disease: The Revolutionary, Scientifically Proven, Nutrition-Based Cure before you decide for yourself what constitutes “good health”. Eventually, I would like to return to my WW meetings. I enjoyed encouraging others to keep working toward their goals. They were also a huge encouragement to me. Because of the Lifetime payment rules, the earliest I would go back would be next week. First, I want to see how a week of paper tracking works for me. In order to have free meetings again, I need to drop 37.8 pounds. I told you it’s been going up rapidly (10-15 lbs of that have been just since breaking my toe). I have shied away from putting any numbers out here in the past, but this time, I’m doing it to hold myself accountable to tracking my points this first week. Update: I’m done with dieting. Check out my Intuitive Eating category for more information. Or, you can start with “Letting Go“. This entry was posted in Food, Freedom, Struggles, Tools by Jules Lane. Bookmark the permalink. I really enjoyed reading your blog, as I too became vegan after becoming a lifetime Weight Watchers member. Being vegan and following Weight Watchers is definitely possible – I have a blog at http://www.veganweightwatchers.com that I hope will be a great resource for people like us. Good luck!